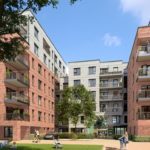 The scheme, which is on the site of a derelict Morrisons, will deliver 176 affordable homes, along with a new 8,000 sq. ft. food store. The homes will be in three blocks, ranging up to seven storeys high and have been designed to incorporate residential, outdoor and retail space and a play area. Steve Leakey, Managing Director of Higgins commented: “This is an important partnership for Higgins, we are delighted to be working with A2Dominion again following our successful Geron Way project. The planning scheme has been designed by Colwyn Foulkes & Partners and the delivery architect will be Fourpoint Architects.